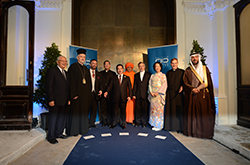 In an unprecedented demonstration of multi-religious solidarity, leaders of Christian, Muslim and other religious communities from Iraq, Syria and the larger Middle East region meeting at the KAICIID Conference "United Against Violence in the Name of Religion" on 19 November 2014 denounced with one voice all violence in the name of religion, and have called on the international community to protect religious and cultural diversity in Iraq and Syria . The newly formed Board of Directors unanimously adopts the KAICIID affirmation . The Agreement for the Establishment of the KAICIID Dialogue Centre enters into force, followed by the first session of the Council of Parties ten days later. At its first session, the representatives of the three founding parties appointed the Secretary-General and Deputy Secretary-General of the Centre. The Council of Parties also elected the members of the Board of Directors and welcomed the Holy See as a Founding Observer. A Preparatory Commission is set up by the States Signatories to lay groundwork for the implementation of the objectives of the Founding Agreement; an Interim Secretary-General is appointed, an Interim Board of Directors elected and other working structures put in place. Recognising the importance of dialogue, the Kingdom of Saudi Arabia, the Republic of Austria and the Kingdom of Spain, following the initiative of King Abdullah Bin Abdulaziz, the Custodian of the Two Holy Mosques, sign the Agreement for the Establishment of KAICIID in Vienna . The Holy See is a founding Observer. The Geneva Interfaith Conference upholds the initiative of King Abdullah Bin Abdulaziz, the Custodian of The Two Holy Mosques, for the need for constructive dialogue among the followers of all religions and cultures. It also resolves to promote the spirit of the culture of dialogue, examine the role of the media and affirms its support to establish an International Dialogue Centre. The World Conference on Dialogue in Vienna sets up a Preparatory Working Group and parameters for a new Steering Group to examine how an International Dialogue Centre might be established and managed. The UN General Assembly, meeting in New York, affirms that mutual understanding and interreligious dialogue constitute important dimensions of the dialogue among civilisations and of the Culture of Peace. The Madrid World Conference on Dialogue brings together 300 followers of different religions and cultures, with a focus on human values that unite Mankind. In a final statement, the Conference calls, among other things, for a Special UN Session on interfaith dialogue. The First International Conference on Dialogue is held in Mecca, Saudi Arabia, bringing together 500 international Muslim scholars, to discuss interfaith dialogue in Islam and to establish parameters for dialogue with followers of other religions. In the first ever meeting between the Custodian of the Two Holy Mosques and a Pope; King Abdullah Bin Abdulaziz and His Holiness, Pope Benedict XVI, share their vision of an initiative for interfaith dialogue. The idea to establish a global dialogue initiative is presented to the Islamic Summit at Mecca, Saudi Arabia – the idea is welcomed by those present.